Mr. Ear, After 364 days of Swole Ear, you have managed to surprise me. I thought of putting some Beefheart on my list of suggestions but immediately put aside that thought after your reaction to Tom Waits. So, yes, I was surprised that you chose this album (all the more so because it is a double album) and even more surprised that you liked it. And your reference to Waits is absolutely on the money. At a time when he was in serious danger of drinking and smoking himself to death, his future wife Kathleen Brennan introduced him to the Cap’n. Tom gave up his bad habits and re-invented his sound . 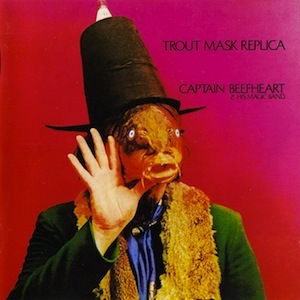 HIs work from “One From The Heart’ soundtrack and “Swiordfishtrombones” has been inspired by Captain Beefheart., as he has recognized on a number of occasions. I too am surprised. I think you have to give Tom Waits another try. Swordfishtrombones time for you Swolechik. Good thing J& is not in touch with Mr. Swole’s pater or he might have something to worry about for the final DRT. Plus why not “(Joe) Frank’s Wild Years”? Would be appropriate. Or “Mule Variations”? Or “Bad As Me”? Any song that name checks Mickey’s Big Mouth is okay with me. Never could stand that dog.